Here’s one more big reason to try and stay away from sugary drinks: you could be increasing your chances of getting endometrial cancer, if you’re an older woman. The National Cancer Institute just released the results of a study that involved over 20,000 postmenopausal women. All of the women were followed for a 24-year period from 1986 to 2010. The NCI researchers found that women who drank the most sugar-sweetened beverages had a startling 78% higher risk for developing a certain tumor linked with endometrial cancer. 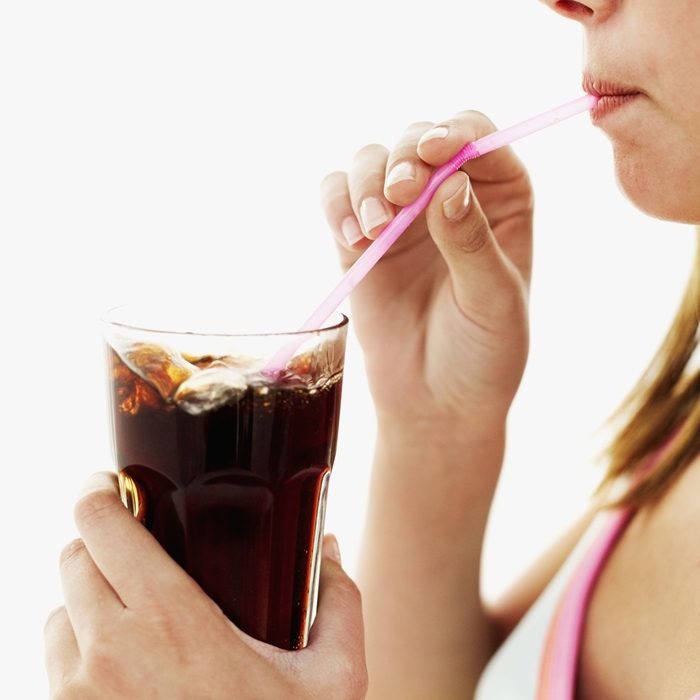 The more sweetened drinks a woman consumed, the higher her risk for getting endometrial cancer. Endometrial cancer usually strikes women when they are in their 60s or 70s. Tumors develop in the lining of the uterus and can spread to other parts of the body. Endometrial cancer is also called uterine cancer. Other forms of cancer can develop in the uterus such as uterine sarcoma, but these forms of cancer are far less common than endometrial cancer. The researchers found no links between consuming sugar-free pop, or sweets such as baked goods and the risk for endometrial cancer. Drinking sugary drinks has been linked in previous research to an increased risk for obesity. Women who are overweight often have higher levels of the hormone estrogen. Increased levels of estrogen have been linked to the onset of endometrial cancer. Obesity also causes a spike in insulin levels. Higher insulin levels are also considered a major risk factor for endometrial cancer. Maintaining a normal weight can help to eliminate these two risk factors. In another study conducted last year, researchers at Lund University in Malmö, Sweden set out to discover if the consumption of dietary carbohydrates was linked in any way to the development of prostate cancer. The research team analyzed 8,128 men between the ages of 45 and 73. None of these men had a history of cardiovascular disease, diabetes or cancer. After 15 years of follow-up, 817 men were diagnosed with prostate cancer. The researchers looked for associations between carbohydrate intake and the incidence of prostate cancer. They found a positive association between the intake of low-fiber cereals and prostate cancer risk. The same risk was noted in those who consumed moderate amounts of cake, biscuits, rice, and pasta. As for sugar-sweetened beverages, compared with those with zero consumption, those with the highest intake showed an increased risk for symptomatic prostate cancer. Here are some other potential health risks associated with sugar consumption. • Sugar can cause your immune system to shut down for a period of time, leaving you at risk for viral and bacterial infections. • Too much sugar can cause your levels of essential minerals to get out of whack. • Sugar can cause adverse mood changes in some people, including anxiety, depression and aggressiveness. • A high consumption of sugar can make it more difficult for the brain to concentrate. • Sugar consumption can increase the free radicals roaming in the body, opening the door for an increased level of cellular damage. • Sugar can impede your body’s ability to absorb and process calcium and magnesium. Preidt, R., “Sodas, Other Sweet Drinks Tied to Higher Risk for Endometrial Cancer,” MedlinePlus web site, Nov. 22, 2013; http://www.nlm.nih.gov/medlineplus/news/fullstory_142797.html, last accessed Nov. 27, 2013. Drake, I., et al., “Dietary intakes of carbohydrates in relation to prostate cancer risk: a prospective study in the Malmö Diet and Cancer cohort,” Am J Clin Nutr. December 2012; 96(6): 1,409-18.